Good afternoon everyone. I promised you some samples that I made for our quarterly training and here is the first one. I got this tutorial from a link on my fellow pink lady Laura's blog. 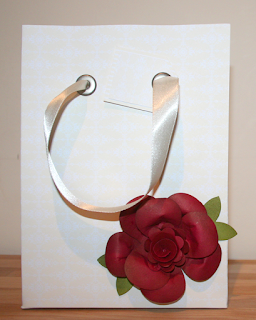 It shows how to make a gift bag out of a 12 by 12 sheet of paper. I will post my own tutorial for that and the owl punch rose tomorrow. This bag was made for my friend Jo's birthday and started off as one sheet of very vanilla designer series paper. I'm really pleased with it, and I think it would work really well for a wedding present as well. 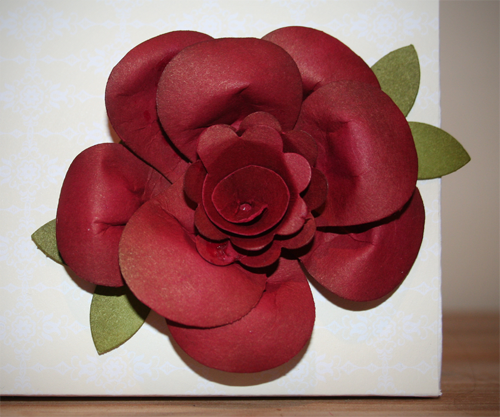 The owl punch rose is in cherry cobbler and I simply can't get enough of this colour! As you can see the jumbo eyelets work beautifully to reinforce the holes for the ribbon handles. I made a 6 by 6 version of this bag which doesn't need the eyelets, but the larger sized bag needs the extra support. I am absolutely loving discovering how much you can do with punches and paper. I am never normally very creative in thinking outside the box, but I have been amazed with how much you can do with one simple punch! I hope you all have enjoyed today's post. Check back tomorrow for the tutorial and don't forget my special offer this month. Wouldn't it be great to be able to whip up a gift bag whenever you need one?